As much as I love my job and the types of books I normally read, every now and then, I love to kick back with an adorable piece of chick lit and give my brain a bit of a break. However, that doesn’t necessarily mean my heart is spared at all. 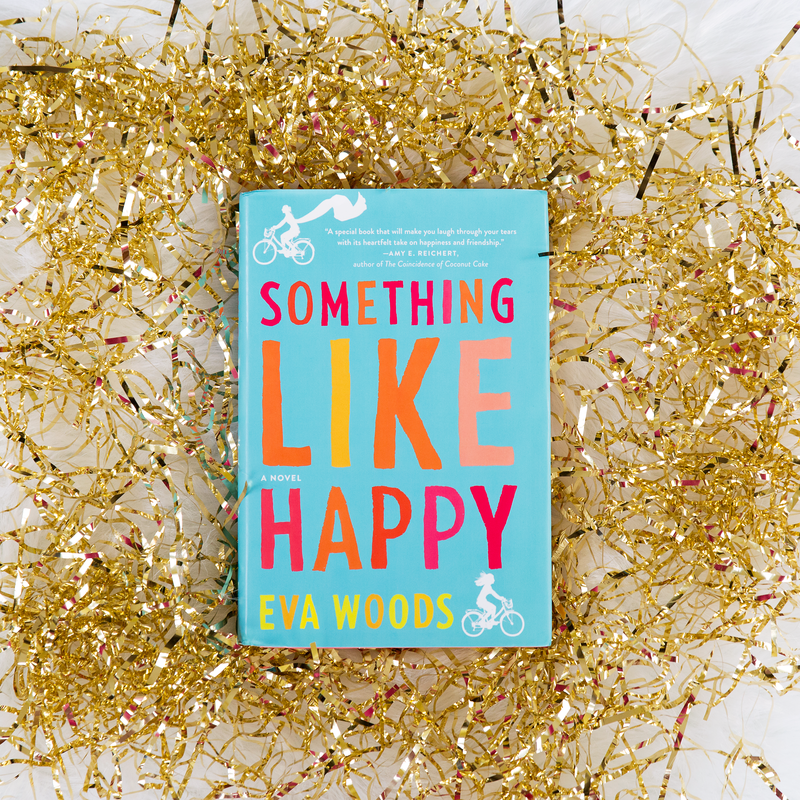 That was definitely the case with Something Like Happy by Eva Woods. Annie Hebden has hit rock bottom. She lost her baby, husband, best friend, and beautiful home within a span of a few short months, and soon after, her mother began losing her memory as a result of early onset dementia. While Annie’s mother is hospitalized, Annie meets Polly, a cancer patient who only has a few months left to live. Instead of wallowing in self-pity, Polly has decided to give the “100 Happy Days” movement a try, and after meeting Annie and immediately seeing how unhappy she is, Polly essentially forces her to give it a try with her. As a result, Annie finds herself doing things she never would have done and meeting new people she never would have befriended before. Meanwhile, as Polly’s health declines, Annie finds herself wondering what will happen to those whose lives Polly has touched once she is gone. Going into a book like Something Like Happy, I knew I wouldn’t be reading the next great American classic. I knew the book would feature plenty of classic tropes and its fair share of clichés. And that’s exactly why I was desperate to read it. I didn’t just WANT to read this book–I NEEDED to read it. I needed those tropes and clichés, and I needed an uplifting read. Although I adore women’s fiction, I tend to stay away from chick lit for the most part because I find single, childless characters looking for love hard to relate to at this particular phase of my life. However, although Something Like Happy has some elements of chick lit, it’s also focused on a main female character who was much more realistic and relatable to me. Annie is in her thirties, has been married and had a child, and has experienced several tragedies that have left her heartbroken and cynical. The book does not focus on her quest to find love (although there is a tiny bit of romance in the book), but it instead focuses on her quest to find happiness. I knew Something Like Happy would be a fairly quick read, leave me feeling more heart-warmed than heartbroken, and lift my spirits a bit from the little valley I seem to have settled in lately in my own journey to discovering happiness. The cast of characters in Something Like Happy is absolutely wonderful. Annie is a very dynamic character, and the Annie at the beginning of the book and the Annie at the end are almost two completely different people. However, Woods has not written her shift as an overnight transformation. The path along the way was filled with several bumps, potholes, and dips, and she didn’t leap into her friendship with Polly full of enthusiasm and optimism. Instead, readers are able to relate to Annie’s cynical view of her life and the world while also understanding the depth of her unhappiness. Polly, although mostly joyful and well-loved by everyone she meets, is still shown to have several of her own flaws, and her relationships with those around her are far from perfect. In addition, Woods introduces readers to Dr. Max and Dr. Quarani, who each have their own distinct personalities and important roles in the plot, but their characters also highlight issues within England’s National Health Service and the unrest in Syria. I personally adored Costas, Annie’s roommate, and by the end of the book, I also found myself quite attached to Polly’s brother, George. My only wish for this book is that it had found a way to tastefully address the idea that the power of positive thinking is not always enough for some people who have serious issues with depression. Although it worked out well for Polly and Annie, others require the assistance of medication…like me. My battle with depression lasted for several years before I sought medical intervention, and during those years, deciding to be happy did nothing to fix the chemical imbalance in my brain. Only once I realized that I needed something more did I finally begin to feel like myself again. Overall, Something Like Happy was a delightful read, although it was filled was plenty of moments of heartache, and it was the exact book that I needed to read at this particular moment in my life. It’s also one of the most aesthetically beautiful books I have seen in a long time, and I’m looking forward to seeing more books from the newly launched Graydon House Books. Eva Woods’s writing is lyrical and fun, and I’m interested to see if her crime fiction (written as Claire McGowan) is just as lovely. If you’re looking for something that might encourage you to take a different approach to life while entertaining you with a lovely plot, give Something Like Happy a try! Posted in FictionTagged 100 Happy Days, Chick Lit, Eva Woods, fiction review, Graydon House, Little Bird Publicity, Something Like Happy, Women's FictionBookmark the permalink.